A complete premium fence kit for safely keeping goats – builds a 50 m stretch of fencing. 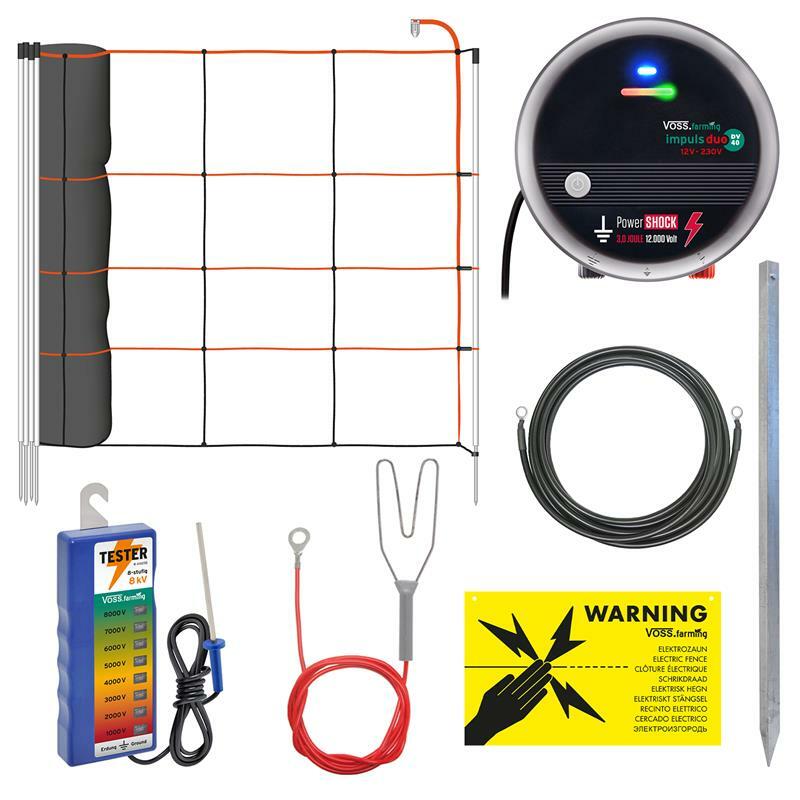 This VOSS.farming® complete goat fence kit comes with everything that goat owners need to build secure fencing. Whether you have nannys, bucks or kids – the netting is suitable for goats of all sizes. This set is special because you no longer need to worry about putting together the fence components. We've already taken care of this for you. You will receive a durable and reliable fence system using high-quality components. Only quality products are used in this VOSS.farming® goat fence kit. The premium complete kit from VOSS.farming® includes the "impuls V50" mains energiser. It is extremely powerful thanks to the innovative PowerShock technology. This ensures your fence always provides a sufficient level of security. A microcontroller permanently monitors the fence voltage and a fault on the fence is immediately indicated by a red light. The netting included is the orange-coloured Euronetz netting, which has plastic vertical struts that prevent the net from sagging . The netting can also be used on hilly or stony terrain, because the post have 2 spikes. All connection cables and posts needed for your goat netting are included in the kit. This complete kit includes a wide range of accessories such as a fence tester or warning sign to indicate the electric fence. The VOSS.farming® complete goat fence kit is a great choice, as the fence system is quick and easy to assemble. We have put together a separate kit for horned goats. This comes with electric fence tape instead of netting which your goats might get caught in. This kit can be found under item number 45737.UK.